Today I have a recipe to share with you that is now my favorite. It’s a lentil rice bowl with lime-tahini dressing. That may or may not sound good to you, but no matter what you are thinking right now I promise you will like it. Well, okay, there may be someone out there not down for the lentil rice bowl but I kind of doubt it. Last week I had a photography job in Orange County. I needed to grab lunch on the road and noticed a place called CAVA. Now that I’m not eating wheat, dairy and sugar and my diet is still quite strict (waiting to get that allergy testing done! ), eating out is tricky. CAVA looked like it could be promising so I decided to give it a try. I am so glad that I did, I love this restaurant! Heartbreakingly, we do not have a CAVA restaurant anywhere near my house. (Insert trombone.) I think the best way to describe CAVA is that it is essentially a Mediterranean-inspired Chipotle. 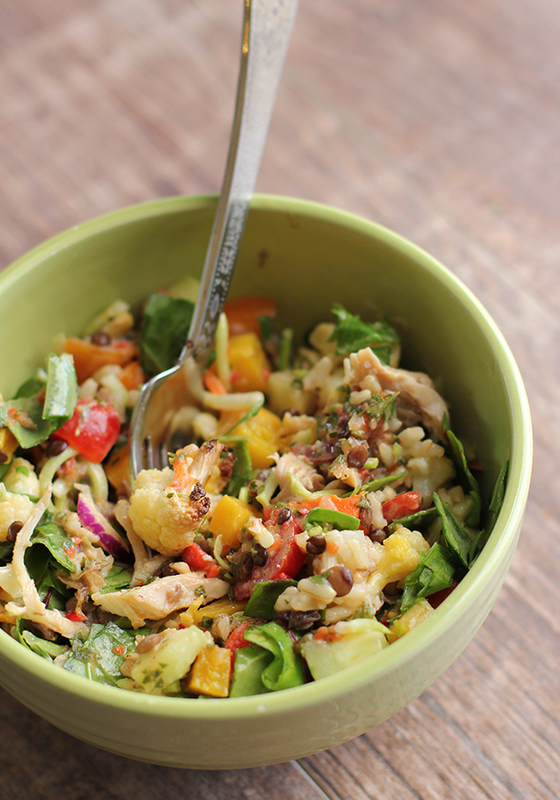 You create a bowl, choosing your grains, greens, proteins, veggies, etc. While there were ingredients that did have wheat and dairy, there were plenty that did not. There was so much to choose from it made me happy! I ended up creating a lentil rice bowl with lime-tahini dressing and was, quite frankly, surprised how much I liked it. I had a bit of my bowl left over when I picked up Owen from school. He ended up stealing the rest of my lunch…I have never seen him inhale unidentified vegetables and grains that way! For the last week he has been begging me to recreate the bowl at home, so last night I gave it a go. This is my new favorite meal. It took some effort to get all the ingredients prepared, but the final dish was worth it. And now I have a fridge full of ingredients I can easily throw together for lunch or leftover dinner this week. Combine the juice from 2½ limes, tahini, water, garlic, salt and sugar in a small bowl. Whisk well and set aside. Roast carrots, beets and cauliflower together in a 425º F oven for 15-20 minutes, or until vegetables are tender. Toss in olive oil and sprinkle with salt before roasting. Cook brown rice and lentils as directed on the package. Put tomatoes and cucumbers in a small bowl, drizzle with olive oil and squeeze the juice from the final ½ lime you haven't yet used. Sprinkle with salt and pepper and toss to coat. 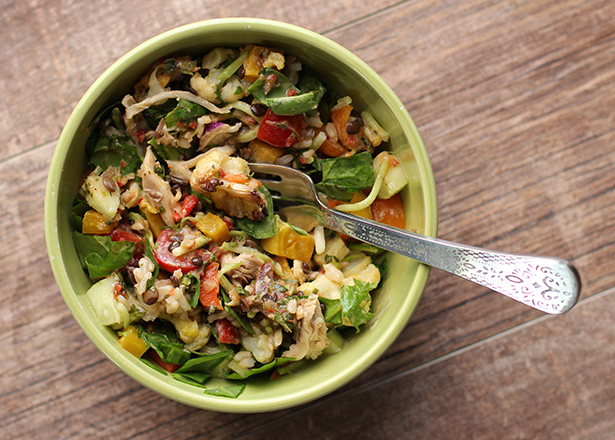 In a bowl, layer the ingredients as follows: brown rice, lentils, chicken (if using), roasted vegetables, greens, slaw, spoonful of hummus, spoonful or two of chimichurri sauce, cucumber-tomato mixture. 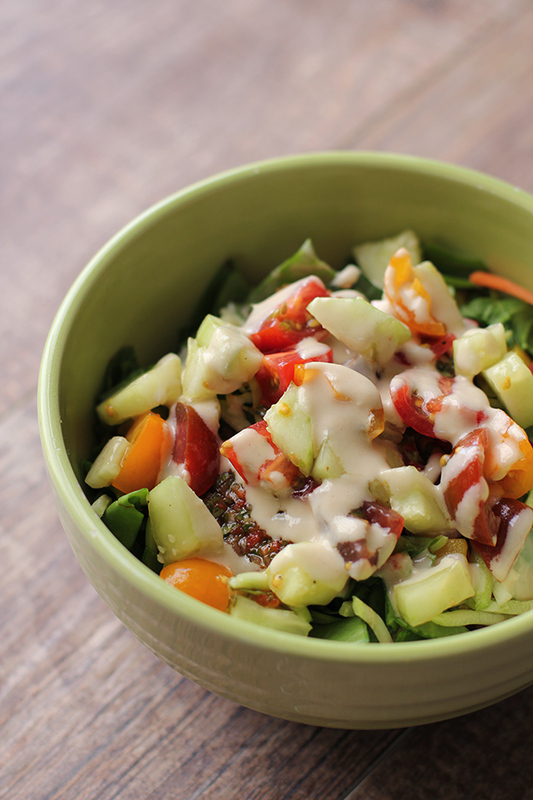 Drizzle generously with the tahnini dressing, mix all together and enjoy! Tip: I mixed and prepared all the individual ingredients in the containers that I would be storing them in the refrigerator in after dinner was done. It made clean-up much easier! Just seeing this now… a little late to the game, but this looks so good! We made this without chicken for one of our Meatless Mondays, it is so filling and delicious, thanks for the great recipe!